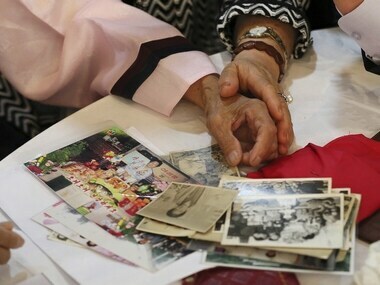 Seoul: Elderly North and South Koreans wept and embraced each other on Friday at the beginning of a second round of temporary reunions of family members separated for decades by the Korean War. More than 300 South Koreans travelled to the North's Diamond Mountain resort for three days of meetings with their long-lost relatives. Earlier this week, about 200 other South Koreans went to the scenic resort for similar reunions. During the meetings on Friday, Kang Jong Hwa, an 85-year-old North Korean woman wearing a traditional hanbok dress, sobbed while touching the face of her 100-year-old sister from South Korea. "I cannot believe this," Kang said. Participants in the latest reunions are to part again on Sunday, likely for good. The two Koreas occasionally allow elderly people to reunite with loved ones on the other side of the border, but none has been given a second chance to meet. The separated families are a bitter reminder of the division of the Koreas, which were once a single country.